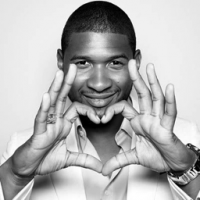 Usher Single and searching for a new relationship! He already gave us some requirements: she has to be sweet (of course) loving, intelligent, self sufficient, she has to gave humour and be adventurous and most important of al: his mum has to like her! Isn‚Äôt that sweet, that he refers to his mother as his best friend, and therefore the person he trusts the most when it comes to finding his life partner. He dated many famous people; Alicia Keys, Solange Knowles (Yes, sister of) and Adriana Lima are just some examples. However, girls, right now he is ready for something new, and it could be you! It’s very good of Usher that he thought about settle down with one women. Buth he has got children and I think he will meet a girl who also has children or an old virgin, hahaha (just kiddin’)!!! I don’t know, buth I think the “chosen” women would be very happy with Usher. He has got an beautifull voice so he can always entertain her and maybe they will have children together, who knows?! i love your music and i wish you was my dad or uncle or cousin!!!!!!!!!!!!!!!!!!!!!!!!!!!!!!!!!!!!!!!!!!!!!!!!!!! i think you arent gonna be single for a long time! !i mean you are so cute! !you think justin bieber is looking for love..